I stopped buying new Fall records seven years before the Unutterable came out in 2000. The Infotainment Scan (1993), and some of the Peel Session recordings, had a musical bed that I'd call Rock Muzak that felt out-of-sync with the cutting talk-rhythms of Mark E. Smith. Fortunately, the sound of the Unutterable is as varied and challenging as the words, which seem to have gotten denser and deeper. Smith - the best punk poet of all time and sometimes called the ultimate "pub philosopher" - is much grander than either label, a singular artist I'd describe as a cross between Charles Bukowski, Monty Python, and, explicitly on the Unutterable album, 18th-century English poet William Blake (b.1757). With lyrics spanning the transcendent (fire from above) to the banal (Oprah! ), and with an equally wide range of vocal expressions, this recording feels like a "last record" even though it's just the 21st of the 31 the band produced. The whole amounts to a psychic grand tour that verges on a musical tour de force. 2018, the year of Smith's death, is a great time to hear it – again, or for the first time. A Fall album called The Unutterable? It's a new kind of title from past recordings with some of the most specific and magical titles ever: Hex Induction Hour, This Nation's Saving Grace, Perverted by Language and In: Palace of Swords Reversed (a compilation of early work). 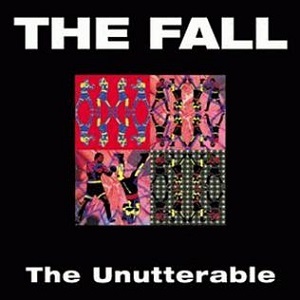 The Fall is about never being at a loss for words: Smith has yelped about feeling "Voxish," and could even "'Putta Block' on the words, stopping them as quickly as he could spit them out. So what does Smith have to say on the title track? [I]read about "The Essence of Tong"
5. Amex card - they made such a fuss about giving it to me, but I spend more time getting it turned down! I was in the realm of the essence of Tong. Mark laughs at the list half-way through. It's a nice moment and part of the psychological lap that is The Unutterable. Smith may be quoting someone (not Blake!) from a magazine article, but I like to think of it as his own words (as a middle-age curmudgeon). Either way, he enjoys the ride and we do, too. Palm Pilot - it's my lifeline. I think it's my P.A. 's computer. She rules my diary and I download it. As highbrow and weird as the Unutterable gets, only Smith could repeat "I am the Caterer" and hypnotize his fans. ...and "Two Librans" shreds! I've heard The Fall delightfully limp; drive; rock; snap, crackle, and pop; and spazz from 1977-1993, but never give us guitar shreddage cranked to 11! At 42, when The Unutterable was recorded, Smith unleashes a Grumpy Old Lion growl I'd not heard before. On the chorus, he also drops his trademark "-AH,": a post-phrase rhythm fill akin to Michael Jackson's dat. The whole of "Two Librans" is as mysterious and hard-hitting as what the Fall produced earlier but new all the same. "W.B" from The Unutterable. Some a generous person put Blake's images to the music. The title track sounds like a chartbuster from a parallel universe, "Way Round" churns out psych-spy rock, "Dr. Buck's Letter" has a Queer-ish Wolfgang Press groove, "Serum" ramps up the industrial synth work, and "Sons of Temperance" is what the last Pixies recording should have sounded like. We also hear Smith's voice with deep reverb, speaking different phrases, with different timbres, in each ear through the musically devolving. "Devolute." The Unutterable holds together musically, as varied as it is, perhaps through a slowly modulating saw-wave synthetic sound throughout. Smith's vocals mostly fit in with the music and frequently he gets in the thick of it, even if the rhythm is not in lock-step. Always Different, Always the Same John Peel, the legendary radio host described the Fall as always different, always the same. That cuts both ways, as the music on his studio sessions gets a little bland in spots of The Complete Peel Sessions 1978 – 2004. Yet the same has blindingly brilliant musical moments, particularly "Smile" from 1983. The band and Smith move as ONE hypnotic beast. The clipped-time signature of the guitar riff and Smith's take-down of phoniness are so caustic it's a wonder the recording tape didn't melt. "Smile" – A Classic MES takedown from 1983. Mark demanded, from various line-ups, that the music evolve and not "sound like the Fall" (and the Unutterable doesn't). I suppose the simple cling clang and bizarre slogans of Palace of Swords sound like the Fall. Smith fired or drove away dozens of musicians through the decades (as cataloged in The Fallen: Life In and Out of Britain's Most Insane Group). Probably to keep in control and to bring out the unexpected. He was glad to disappoint those who came to see "Totally Wired" (1980) in the 2000s. In his autobiography, Renegade: The Lives and Tales of Mark E. Smith (2008), Smith repeatedly calls the other members of the Fall, "The Musicians" – a different kind of animal he doesn't understand or like. But he has also said that the band gave him the freedom to be a writer and not work in isolation. His band behind him, Smith purged enough mental bile filtered enough alcohol with his liver to make it to age 60. The shallow "slags" and less-talented and real than him (most everyone) were his targets, but he didn't carry a punk hostility to the audience. Smith signed off his autobiography with "Your Friend, Mark E. Smith." Smith invited us to drink with him at the pub; and though we didn't get a word in edgewise, it didn't matter.